I woke up today feeling grateful. This has never happened before. Occasionally, I wake up smiling, but I usually start the day in neutral or droopy. The object of my gratitude was my backyard. It’s one of the first things I see when I open my eyes. I was grateful for feeling grateful, but I also felt a little weird. What was going on? I’ve been trying to be a grateful person for five years with little success. First I tried keeping a gratitude journal, and then I tried to think about things I am grateful for during my morning meditations. I made lists in my head and waited for the feel-good reward that didn’t materialize. Gratitude started surfacing a few weeks ago, surprising me like my one-lick dog Lance does when he gives my an extra kiss. I’m happy, confused and wondering what I did to earn the extra affection. I think gratitude seeped in when I slowed down, way down, and gave myself space to listen, think and feel. It’s something I decided to do when my dad died last summer. I didn’t want to shut down and rush back to work like I did when my mother died. That tactic had long-term, negative consequences. My mother died thirty-six years ago, and I still cry every time we drive by a car accident. 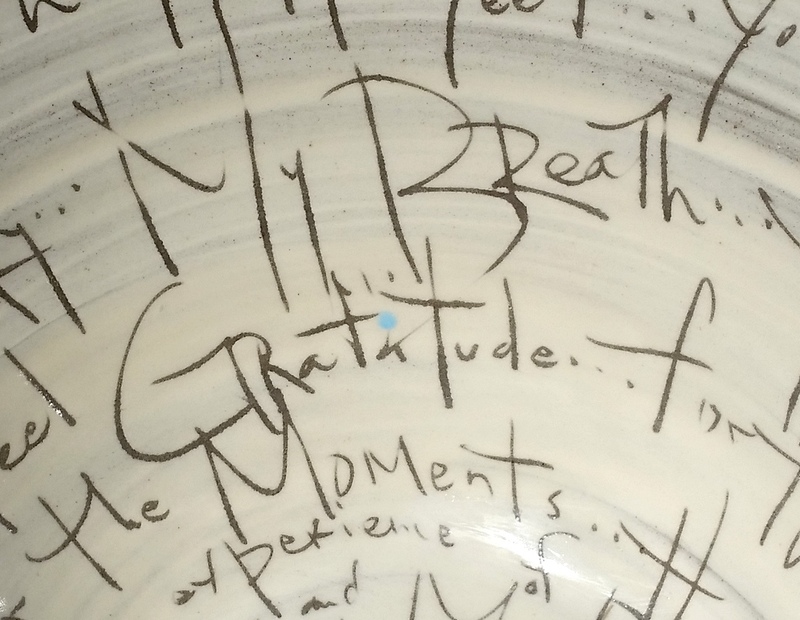 Gratitude took root during nine months of slow living. I spend most of my time at home sitting around, reading, writing, gardening and doing household chores. Occasionally, I substitute teach at the Atlanta Girls’ School, and I go to yoga class. Of all the seeds I planted when I decided to slow down and live with intention, I wasn’t expecting gratitude to germinate. I had my mind on peace, forgiveness, and love. My fingers were crossed for writing and good mental health. And then, out of the blue, I got gratitude, like a lottery winner who forgot about her ticket. I hope my good fortune comes to mind the next time I freak out about not being a busy person with a bigger job. Or when someone asks me what I do for a living. In these instances, the words blog writer and substitute teacher come out in a cup full of anxiety. Then I feel lazy and unimportant until I go home and revisit my choices. This new gratitude reflex is a sign that a slow path will lead to more goodness. I simply must remember this the next time someone asks me what I do. Beautifully said and am,happy for you! I like the way you expressed your “new found” gratitude feeling! It made me stop and think! I want to get and keep a “gratitude” feeling too! Thanks! I sure do appreciate you, Judith! Thank you so much for the reminder to s-l-o-w d-o-w-n and to be mindful. You have helped me! Thanks for letting me know, Priscilla. It’s great to hear from you! Slowing down is really hard, especially when you’re a working mom. I hope you and the girls are doing well.